Three of my little sweet shot-glasses. So yummy! I belong to a "members-only" Facebook cooking page established by my friend, famed Canadian chef, Norene Gilletz. People share recipes, pose query's and exchange ideas. 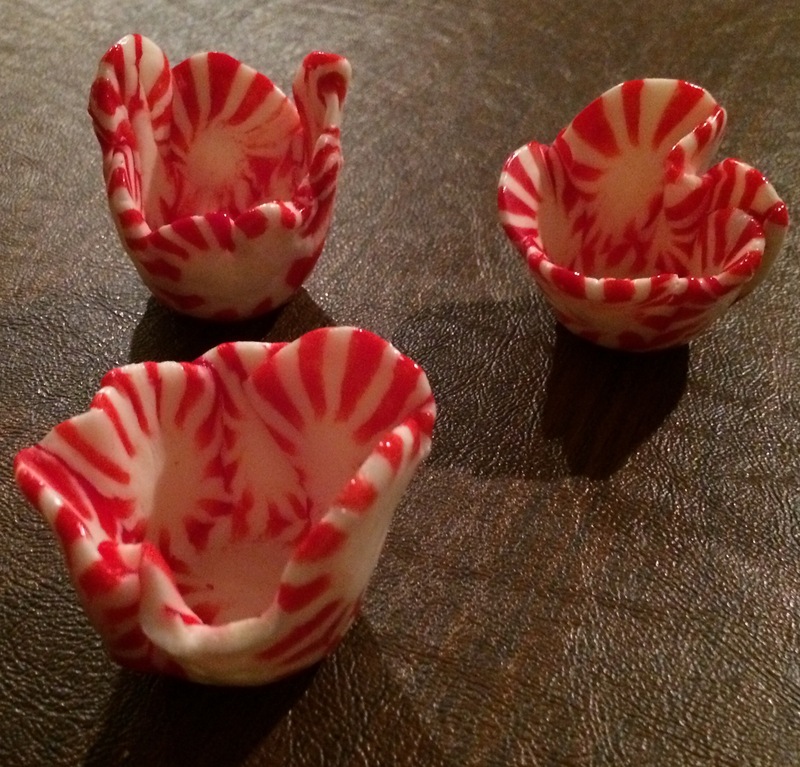 Someone posted a blog from "The Watering Mouth"that includes a recipe and video link for how to make these peppermint candy shot-glasses. It's a homemade YouTube video and very funny. I was going to visit some friends during the Chanukah/Christmas/New Year's season and thought these would be a fun gift to bring. No ingredients could be found for this recipe. Purchase a LARGE bag of peppermints. Some of the candies will be broken and won't be useable. I was able to make 12 shot-glasses from 1 large bag. Definitely keep an ice-cold glass bottle near-by (you will need it to cool your hands). The candies take almost exactly 10 minutes (perhaps 10 minutes and 30 seconds) to melt in a 300-Degree Fahrenheit oven. (But WATCH your oven - you don't want them to get soup-y or burn - and use a HEAVY DUTY COMMERCIAL-GRADE cookie sheet lined with parchment paper (do NOT grease the parchment paper). Remove the cookie sheet from the oven (and keep the oven on), keep testing the melted candies until they have hardened JUST enough to lift off the parchment with a spatula but are still soft and pliable. Working quickly, drape it over an over-turned shot glass and quickly mold it into the shape you want. You'll find that the candies harden fast. You'll have to put the cookie sheet back into the oven and remove each individual flattened shape with a spatula - from the cookie sheet in the oven and drape it over the over-turned shot glass. Serve room-temperature liquids in them (liquors), chocolate mousse (that has been stored in the fridge and then you can pipe into the little bowls), warm (but not hot coco)...Have fun! Here is the link to the The Watering Mouth’s original blog post with her recipe and video of how she makes them. Enjoy!